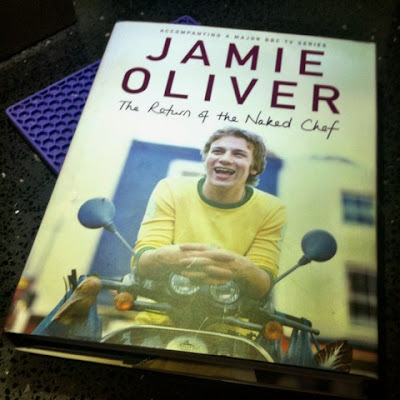 This week it's a vintage Jamie recipe - look how young he looks - from his second book The Return of the Naked Chef. They're called Botham burgers as they used to be on the menu in the pub Jamie grew up in, whose name was The Cricketers. Jamie suggests shaping them round like a cricket ball too. Howzat! 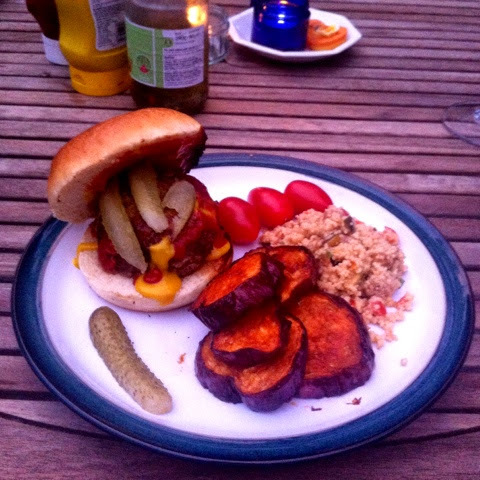 With the weather staying warm we've been making the most of our BBQ and the plan was to use it for these burgers. As luck would have it, the day we had these it was raining by the evening. Although that was probably a good thing as they were huuge! I halved the recipe as there are just two of us, so that was 1/2kg of mince, 1 red onion, 1 egg, breadcrumbs, Dijon mustard, crushed coriander and cumin seeds and seasoning. I started by trying to mix this with a silicone spoon, but quickly realised this wasn't very effective or the Jamie-way! So there was nothing else for it but to use my hands to "mix it and scrunch it all together". Jamie would have been proud of me. He might've been less proud though, when I made this into four burgers instead of two - even to carnivore-me this seemed a lot of meat (and unnecessarily so) for one meal. The result was still a satisfying meal and two more burgers ready to freeze. Bonus. Look at the size of [half of] them! I cooked these in the oven for 25 minutes, they probably could have done with slightly less for a pinker middle. 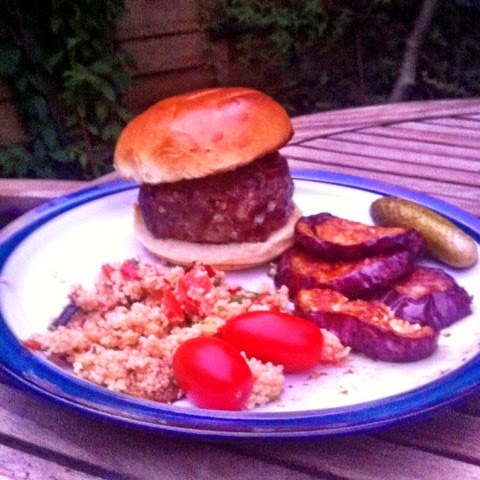 I served these with a roasted vegetable couscous salad, some cherry tomatoes and marinated BBQ-favoured aubergine slices as well as the usual burger accompaniments of burger rolls, American mustard, ketchup and gherkins. They were huuge, even with half of them - but on the other hand I do have another two ready-made! 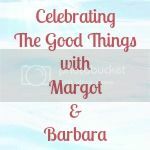 These were probably the best burgers we've had for a while, that and the fact I have another ready to go makes me happy, so I'm linking this post to the Good Things Linky over at Margot & Barbara.